Who would have thought that an anxiety-provoking sprint after the bus could illicit, and even add to your physical activity? Some neat new research into Incidental Physical Activity has eluded some unsuspecting findings that I will elaborate on in this blog. First and foremost, I will provide a definition of what incidental physical activity is. What is incidental physical activity? Incidental physical activity is any form of activity of one’s daily living that is not associated with the purpose of health nor a sacrifice of one’s time (1). Examples include: walking a short distance to the bus-stop, taking flights of stairs at work (notice the suffix is stairs) and riding to and from work. As mundane as these repetitive tasks may be there is a great opportunity to utilize more energy. For any nerds out there, ATP! In a editorial published in the reputable journal: British Journal of Sports Medicine, Stamatakis et al, took two sedentary healthy groups. The active group was asked to walk three flights of stairs, every four hours of his/her working day, three days per week for two weeks. The control group remained sedentary for the two weeks of the short study. The independent variable was measuring cardio-respiratory fitness which we have good evidence is a strong predictor for mortality. Findings from the aforementioned found that the active group’s cardio-respiratory fitness had a significant statistical improvement over the control group. Now there are limitations to this study (age cohort, duration of study). However, to mandate incidental physical activity as a genuine form of physical activity is great. I hope to see incidental physical activity implemented, along with the physical activity guidelines. The guidelines are: 150 minutes of moderate aerobic physical activity a week; along with two resistance sessions per week. So what is the punch line? Intensity will also contribute to overall cardio-respiratory fitness. There is continuing evidence that short bursts of high intensity exercise, lasting 5-10 seconds is extremely beneficial to the power-house of the cell: Muscle Mitochondria Biosynthesis (1). 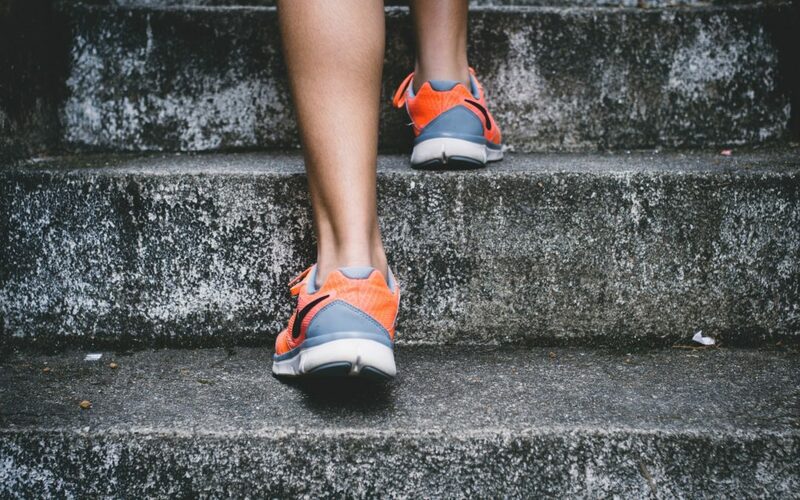 Climbing a few flights of stairs with a little vigor will nicely spike the heart rate for a short period. It may even help with an adrenaline release, if one is on their way to an important meeting. So now that i have given you the gist of incidental physical activity, what would this look like in a typical day? For example: 5 minutes walk up-hill to the bus stop (am), 1 minute walk up the stairs to work (am), Brisk walk home from the bus stop- 3 minutes (pm), playing with your children/participating in their physical activity 15 minutes + (pm), carrying the shopping into the house 1+ minute (pm). As you can see, there are ample times in the day to increase one’s heart rate, utilize strength, and fast-twitch muscle recruitment. Have a good think about what resources you have access to. Make a conscious effort to utilize your resources. And have a good go! Of course. Always consult with your GP and Exercise Physiologist when increasing your level of physical activity. Stamatakis, E., Johnson, N., Powell, L., Hamer, M., Rangul, V. and Holtermann, A. (2019). Short and sporadic bouts in the 2018 US physical activity guidelines: is high-intensity incidental physical activity the new HIIT?. British Journal of Sports Medicine, pp.bjsports-2018-100397. It would be rhetorical to say: that your body is special. And you would only want the best to be guiding you through your health and well-being safely. And yet, one can still be suggestible- picking up dodgy anecdotal tips from ‘that guy’ on the lat-pull-down machine. I have personally experienced the exercise benefits, being safely loaded, and moving with confidence with one of my colleagues. Leaving my body and surrendering to an expert has given myself a deeper appreciation of the importance of finding an expert in human movement. I have always been on the other side to what I have been accustomed too- and as bias as it sounds: my colleagues here at iNform health really know how to manage and care for their clients. Here are three reasons why you should be exercising with an expert. 1. Your tissues need time to adapt to load. Your tissues, all the way down to the extracellular matrix- are for ever adapting to stressors and making proteins. Prescribing appropriate load- will ensure ones tissues will safely adapt; which will add a host of benefits to ones neuromuscular system. Reduced risk of tendonopathies, appropriate motor learning and myonuclei growth (muscle hypertrophy). On the contrary, excessive loading that exceeds the capacity of the neuromuscular system can induce the contra effects to the aforementioned. Tendon pathology, disorganised motor learning due to inappropriate load and systemic inflammation (abnormal prostaglandin levels) due to poor tissue healing. 2. Assessing the capacity of the neuromuscular system before undertaking load is paramount- and if neglected, your ‘health professional’ is going in blind. If there is a muscle inhibition due to de-conditioned tissues, or a previous pathology that was poorly rehabilitated, would you feel safe to be loaded? Or if you were unable to co-contract your gluteus maximums, or have adequate lumbo-pelvic control? And yet, you may still be subjected to axial loading in your first session…! A thorough musculoskeletal assessment can identify any red flags and give your health professional valuable subjective/objective information to prescribe appropriate exercise correctives. This will then ensure more complex movements are performed safely. 3. Co-care is so important in addressing the whole individual. Here at iNform, our clients are closely monitored by a wonderful internal/external team of allied health professionals; ranging from: GP’s, physio’s, osteo’s, chiros, pod’s and psychologist (without exhausting). All working and communicating together for the greater good of your physical and mental health. Co-care leads to better clinical outcomes, a proper working diagnosis, and the right form of treatments that benefit you the individual. So, next time you are wanting to move with confidence. Be interrogative with your research. Find an evidence based approach that doesn’t involve a lecture from ‘that guy’ wearing a weight belt with a skimpy muscle singlet (stereotyping much? ).